So… what are you going to do about it? I’m currently in Amansie West, Ghana as part of a team conducting research on the barriers and facilitators to family planning use and the role community health workers play in family planning uptake. During this time, I was invited to attend Ghana Health Service’s first National Maternal, Child Health and Nutrition Conference by Millennium Promise, a co-sponsor of the conference and our collaborator in country. The collaboration with Millennium Promise first began back in September when Chief Nat Ebo Nsarko, the Country Director visited Duke University. 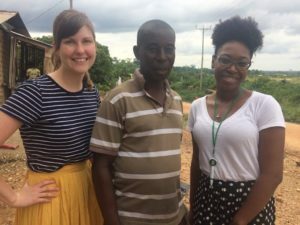 From the beginning this team has been our guide for conducting research in Ghana through assisting us in each task and facilitating our learning experience. It is through their contributions and dedication which have allowed this research to not only be possible but successful. The theme of the conference was “Strengthening Partnerships for Achieving Universal Health Coverage in Reproductive, Maternal, Newborn, Child and Adolescent Health and Nutrition.” Gladys Ghartey (Head of UN System Unit at Ministry of Finance) opened the conference with strong words: “Some women sign their death warrants by becoming pregnant” and then posed the question to the audience: what are you going to do about it? Partners from across health sectors came together to answer this simple but life altering question: what are we going to do about it? 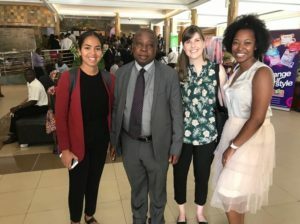 Leah, Maya, and Millennium Promise intern Mariam Gulaid meeting Ghana’s Minister of Health at the first annual National Maternal, Child Health and Nutrition Conference. My research partner, Maya Stephens, and I were given the opportunity to shake hands and rub elbows with many important figures in Ghana, including the Minister of Health Hon. Kwaku Agyeman-Manu! This was a wonderful experience to be able to interact with those who have made it their mission to make a healthier Ghana. Professionals from many organizations came together to showcase their research, interventions and plans for the future. From these presentations it was evident that Ghana is not only striving to accomplish the SDGs but also to go beyond them to provide the best health care for all its citizens and ensure no one is forgotten or left behind. During my two days at the conference, I was fortunate to attend the ‘Improving Access to Family Planning’ breakout session. Through this session I learned from different organizations of new strategies to meet the FP2020 goals (PSI), how involving religious leaders in northern Ghana could improve family planning uptake (World Vision Ghana) and was reminded that people with disabilities need equal access to family planning services (UNFPA). But what am I going to do about it? This question from the opening of the conference was lodged in my brain. As I listened to presentations I experienced an odd mixture of inspiration and distress all at once. These people were professionals trying to conquer these large problems, but I am only a graduate student – so what can I even do? How can I make an impact? Currently, I am living in the village, Manso Nkwanta, in the Amansie West District of Ghana. For the last month, my research partner and I, along with the Millennium Promise team, have been conducting surveys and in-depth interviews with women from the community to better understand the barriers and facilitators that surround a woman’s ability to use family planning. Through my time collecting data I started to realize that maybe I could finally answer this question. One afternoon, Eric Akosah (one of our wonderful collaborators) explained our mission for being in the community to the Assembly Man (elected head of the Watreso community) Hon. John Henry Damah. After this the Hon. John Henry Damah began to share with us the problems of his community and what needed to be done to improve family planning use. Witnessing the Assembly Man’s trust in Millennium Promise and the love he has for his community, I realized all of us, even us graduate students, can be part of answering this question. If we enter the field with open minds and a passion to serve people, we can not only conduct quality research but make our research count. As my time in Ghana is ending I know that I am leaving the communities I have come to cherish in good hands. The people of Millennium Promise have such a passion for what they do and are deeply involved in the communities they serve. I cannot wait to see what comes of this research. I know this is only the beginning of making a healthier Ghana.